Ian Kinsler returned to action in style as the LA Angels (11-3) defeated the host Kansas City Royals, 7-1. Kinsler — who had been on the disabled list with a pulled groin — launched the second pitch he saw into the stands for a lead-off home run, the 47th of his career (235 total). It was his only hit in five at-bats. 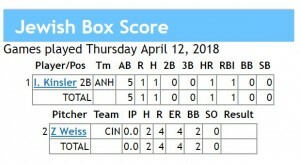 Zach Weiss made his Major League debut for the Cincinnati Reds (2-10) against the visiting St. Louis Cardinals (6-7). The word “inauspicious” immediately comes to mind: He gave up back-to-back home runs to the first batters he faced and then walked the next two before coming out. This means he has an ERA of infinity, since he did not retire anyone. 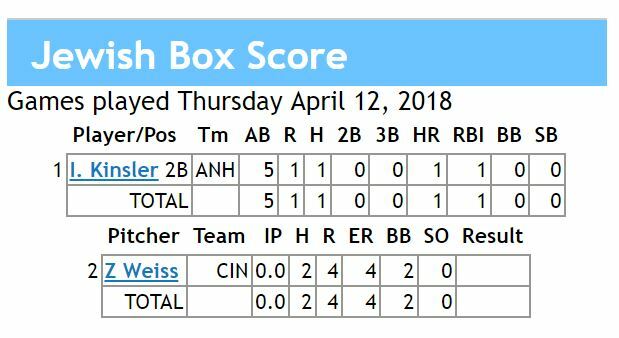 Nevertheless, a big day for Zach and Jewish baseball fans everywhere. May his next outing be a success. Every other MOT had the day off.